Celebrate Today With The Wench!!! 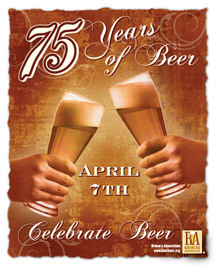 COME CELEBRATE THE 75th ANNIVERSARY OF THE RE-LEGALIZATION OF BEER IN THE UNITED STATES!!! 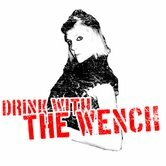 You are all invited “Drink With The Wench” and celebrate legal beer drinking! WHEN: MONDAY. April 7th – start 6pm (Stragglers are free to come whenever). WHY: In celebration of the re-legalization of beer drinking in the United States. HOW: Bring your favorite domestic beers to share and taste with the group! I intend on this being a great social forum and conversation starter for beer lovers across all levels of expertise. Even if you do not know me, I still encourage you to come out and play. Everyone that has turned out has had much fun thus far. There have been lots of new faces meeting me out, as well as some lovely regulars. I’m really enjoying meeting new people and sharing great conversation! As always, I will be bringing along copies of a tasting sheet I found at Ratebeer.com. It helps serve as a great learning tool and conversation facilitator. YOU have been cordially invited to celebrate the 75th Anniversary of the re-legalization of the manufacture and sales of beer and wine. In one of his first addresses to Congress as president, FDR announced his intention to modify the Volstead Act, which prohibited the manufacture, sale, or transportation of intoxicating liquors within the United States and its territories. Congress passed the Beer and Wine Act, which exempted both beer and wine from the Volstead Act on March 22, 1933 – just two days after FDR’s inauguration. It became effective on April 7, 1933. The Beer and Wine Revenue act was followed, in December 1933, by the passage of the 21st Amendment, which officially ended Prohibition. We had a huge turnout for “Drink With The Wench” – Tour de Barley’s on Friday evening. Many were familiar faces: Mandy, Josh, Jim, Keith, Roland, Jessica, and the Wench — as well as some newbies: Somer, Lauren, Sara, and Vivian. We were a bit nervous about hosting the event at Barley’s — since the Arnold Classic was being held across the street. Upon arrival, I was pleasantly surprised to find plenty of space. Apparently an Ale House that is known for greasy food and beer is not popular amongst the fitness gurus. Go figure. We were able to take over the entire “Seat Yourself” section in the bar area, which turned out to be very comfortable. We discovered that both french fries and Jeni’s Ice Cream (especially her latest flavor: Roxbury Road) pair excellently with beer. Mmmmm. Barley’s Pale Ale: American Pale Ale, on draft. Appearance: average/ frothy white head, good lacing, clear amber brown color. Aroma: light straw malt, light flower/ grassy hops, light yeast. Palate: full body, mineral texture, lively carbonation, bitter finish. Flavor: average duration, moderate acidity, heavy bitterness. Overall: a pretty decent Pale Ale. Barley’s Alexander’s Russian Imperial Stout: Russian Imperial Stout, on draft. Appearance: small/ diminishing frothy head, good lacing, hazy body, lightly cloudy particles, dark red brown color. Aroma: toasted/ coffee/ molasses malt, light pine hops, peach, charcoal. Palate: medium body, thin texture, soft carbonation, chalky finish. Flavor: long duration, moderate sweetness, light acidity, moderate bitterness. Overall: Unique stout with a decent balance of malt and hops. Stone Ruination IPA: Year-round IPA, on draft, ABV 7.7%. Appearance: average head, light cloudy particles, orange color. Aroma: roasted malt, pine/ flower/ citrus hops. Palate: full body, thick texture, lively carbonation, bitter finish. Flavor: long duration, light acidity, heavy bitterness. Bear Republic Racer 5 IPA: India Pale Ale, on draft, ABV 7%. Appearance: average head, excellent lacing, clear body, lighlty cloudy particles, light yellow color. Aroma: light malt, average citrus/ grass hops, light yeast. Palate: medium body, alcoholic texture, lively carbonation, metallic finish. Palate: average duration, moderate acidity, moderate bitterness. Josh got creative and ordered a black and tan, combining Barley’s Pale Ale with Barley’s Russian Imperial Stout. It turned out to be a pretty decent combination. Barley’s Ale House No. 1 was a perfect venue for “Drink With The Wench.” I definitely foresee trips back in the future. We will also have to check out the second Barley’s location, Barley’s Smokehouse Brewpub over on Dublin Road. Rumor has it (on the Barley’s website) that Bell’s Hopslam is on deck to be a guest tap. When that happens, I will be one of the first people there to try it! Stay tuned for information on the next tasting! When rating and tasting beer, it is absolutely crucial to evaluate its appearance. This is why I will always pour a bottled beer into a glass. Color affects the way people percieve a beer and gives it expectations. The color of beer can be a powerful but often subconscious generator of positive or negative responses developed pre-tasting. For American brewers, the Standard Reference Manual (SRM) is the standard measure for degrees of color as related to beer and the grains used to brew it. SRM is roughly the equivalent of Degrees Lovibond (degL), the British measurement of color. The numbers are about the same between the two scales, and they tend to be used interchangably — unless beer color moves into the amber regime, at which time the relationships between visual and spectrophotometric units start to diverge sharply. The color degL, which depends on the color of the malt, ranges from 1 to around 600. Lower values of the color measurement correspond to lighter beers and higher values to darker beers. For example: pilsner malt measures 1 while black patent malt, a grain commonly used in stout, rates around 550. Commercial breweries measure SRM color using a spectrophotometer, a sophisticated device that provides an accurate machine measurement of the quantity of monochromatic light, either absorbed, or passing through, the liquid. Differences in brewing conditions can lead to substantial color changes in the finished beer, these effects being particularly important for beers at 5 degL or less. Water. As the alkalinity of the water increases, so does the extraction rate of the coloring pigments in malt. The mash pH I has the same effect, and increasing pH leads to worts with deeper color. Mash. Color increases with the amount of contact time with the grains. Thus, a prolonged mash will produce a deeper-colored beer than a short mash. Kettle boil. The Maillard reaction also takes place as wort is boiled; therefore, wort color increases with boil time. A fact that is sometimes overlooked is that wort simmering has the same effect. The point is that this will lead to an incomplete hot and cold break, which in turn leaves more coloring elements in the finished wort. Hops. Some color is obtained from hops both in the kettle and in storage containers when postfermentation hopping is used. Fermentation. The proteinous matter produced during the cold break is full of coloring materials and, hence, removal of these materials will reduce color. It has been reported that color changes during fermentation vary with yeast strain. Filtration. This can dramatically reduce color. It should be noted that a clear beer will appear to be lighter color than turbid beer. Oxidation. At all stages of brewing, air pickup will deepen beer color. This is as true of hot wort production as it is of bottled beer with head-space air. For additional information on beer color check out: Beer Color Laboratories.